Brigadier Hank Bowen has died aged 87, he received operational awards of the OBE and MBE in the course of a distinguished Army career. In 1971, Bowen assumed command of 4th (Fermanagh) Battalion, Ulster Defence Regiment (4 UDR), in Enniskillen. It was a time of growing unrest in Northern Ireland – internment and the lead-up to the suspension of the Stormont Parliament, the emergence of the Provisional IRA, car bombs and barricades in town centres, and the murders of regular and UDR soldiers, RUC policemen and innocent civilians. Bowen had the task of converting what had been essentially a part-time police reserve force into an infantry battalion. He instituted a rigorous training programme in which the battalion’s role was to support the Regular Army and the Royal Ulster Constabulary by providing mobile patrols that could set up roadblocks at border crossings and guards at vulnerable points where there was a threat of a large demonstration. Slowly but surely standards rose. As the insurgency became increasingly violent, the UDR became a major target of the Provisional IRA. UDR soldiers did not live in barracks but at home and were particularly vulnerable when off-duty or close to the border. During the next two years, Bowen lost 12 of his men to shooting or bombing. A few of the local grandees sometimes caused difficulties. One of them behaved as if a company of the UDR was his own private militia. Another regularly used an illegal crossing point and then protested when he was stopped. Bowen was an indulgent host but drew the line at permitting guests to bring their pistols to his parties. In 1973, on the completion of a most challenging tour, he was appointed OBE. Derek Harvey Bowen, the son of a sapper officer seconded to the Indian Army, was born on February 4 1930 at Pachmari, India. He was educated at the Lawrence Royal Military School, Sanawar, where he played for the first cricket, football and boxing teams. In 1949 he was commissioned from RMA Sandhurst into the Corps of Royal Engineers. Always known as Hank, he was posted to 32 Assault Engineer Regiment at Tidworth as a troop commander. Before he could drive a car, he had learnt how to drive a tank and a 10-ton lorry. In 1958, towards the end of the emergency, he returned to England to instruct at Sandhurst. He was appointed MBE the same year. In 1963, he took 68 Independent Gurkha Field Squadron to Brunei. During the next two years, they deployed to Borneo three times. This was during the confrontation (or undeclared war) with Indonesia. Every jungle base needed several airstrips suitable for fixed-wing aircraft. Bowen’s men were trained to rope down from a helicopter and cut out a usable landing zone in a few hours. The first landing pad might be on a mountain peak and if the weather deteriorated the section could be marooned for a fortnight. Shelters had to provide protection from mortar attacks and it was during this period that Bowen engineered a timber-framed dug-out section post which became known as the Bowen Bunker. Prefabricated components were flown to forward areas for the infantry to dig and assemble. While the bunker proved effective, it was unpopular with infantrymen, given its damp quarters, attraction to snakes and rats and the hard work required to construct it. After a staff appointment in Norway at HQ Allied Forces Northern Europe, in 1970 Bowen returned to the Gurkha Engineers as regimental second-in-command to oversee the move of the Gurkha HQ from Malaysia to Hong Kong. Command of 4 UDR was followed by a posting to the School of Military Engineering as Chief Instructor Tactics. In 1975 Bowen was promoted to Colonel and became Commander Royal Engineers. 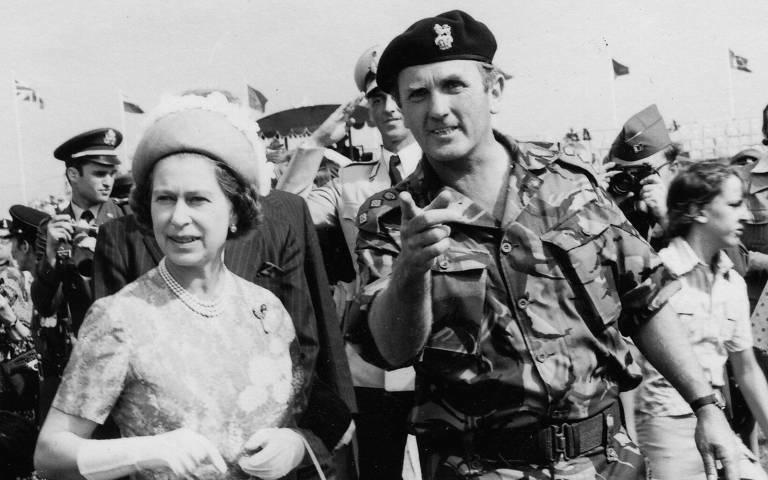 Based in Herford, Germany, he then accompanied the Queen for her Silver Jubilee Army Review at Sennelager in 1977. A posting to the Logistics Division of NATO HQ Allied Forces Central Europe took him and his family to Holland. In 1980 he was promoted to brigadier and became Commander Engineer Support Group, effectively the Chief Engineer United Kingdom Land Forces. In 1983, his last year of military service, he was appointed an ADC to the Queen. He retired from the Army in 1984 and embarked on a 10-year career with WH Smith as divisional director of staff and training. He was seconded to the Thames Business Advice Centre, spent time with the Prince’s Trust and became a trustee and director of Royal British Legion Industries, a role he filled for seven years. He also served as chairman of both the Perowne Trust and Gurkha Engineer Association. He wrote Queen’s Gurkha Sapper (1997), a history of the regiment. Retiring from paid employment in 1992, he enjoyed golf, gardening and playing bridge in his Tisbury community. Hank Bowen married, in 1962, Juliet Ouvry, the daughter of Commander AAC Ouvry DSC, RN. She predeceased him and he is survived by their two sons and a daughter.